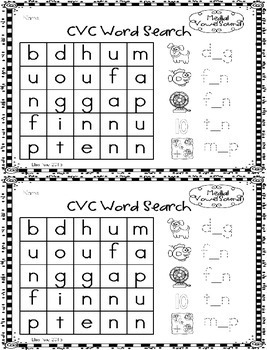 This is a set of 33 CVC word search puzzles. 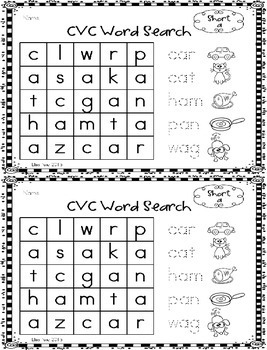 Each word search puzzle contains 5 CVC words along with its picture. There are 3 different sets for students to work on. Each set contains 11 puzzles. Set 1: Puzzles are by medial vowel sound. 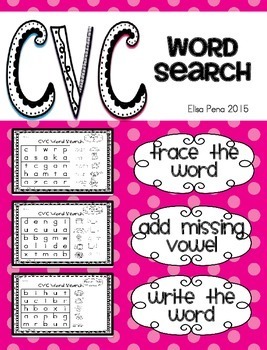 Students will work on tracing each word before searching for it. Short a has 3 puzzles, the rest of the vowels have 2 puzzles each. Set 2: Students will add medial vowel sound to complete the word. These puzzles are mixed vowel sounds. Set 3: Students will sound out and write the whole word. These puzzles are mixed vowel sounds. Each puzzle is 1/2 sheet of paper.